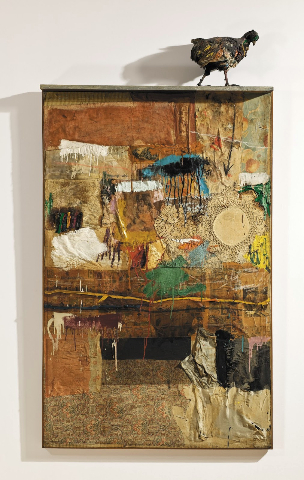 The Rauschenberg retrospective on the scale of the Stella show that closed last year is on its way to New York. I am wary of any attempt to see this exhibit, since my visit to the Stella retrospective at the Whitney in 2016 got my car towed with a hefty ransom to get it back. The dichotomy of the physical world where an object (my car) violates very real traffic laws because it interferes with the flow of traffic (a very real concern in NYC) and the museum show of an artist’s flights of the fancy troubles me and got me thinking about the disconnect between truth and art. So I will not risk my car in New York and, since I already have a feel for the show from comments by the Abstract Critical followers on Twitter in England ,where Rauschenberg's work was on exhibit at the Tate, and now by a review of that same show by Jed Perl in the New York Review of Books, I will risk some opinions on Rauschenberg's oeuvre without the whole package in front of me. I mention my real car and real laws of the outside world as this has some resonance with an often repeated quasi- Delphic statement made by Rauschenberg about how neither life nor art can be made and how his painting functions in the space between the two. Life is considered by him to be the hubbub outside the window except that it is not really outside of us in so far as we can successfully move in it only if we acknowledge its rules and regulations, which I didn’t when I ignored the no parking signs in NYC. His is a rather sophomoric statement on the level of the declarations of cosmic meaning of the stoned frat bros in “Animal House”. Perl does a good job of deconstructing the statement’s illogic. My first reaction is that, if for Rauschenberg painting exists between art and life, then does that mean that painting is not art. As for life, it follows very real laws. They may be hard to discern at times but they are formative. Perl points out Picasso’s drive for perfection. Is not this drive for perfection a struggle to discern rules that shape our world, of putting things back together again into a higher level of order? Rauschenberg is someone who knows how to take apart but does not know how to put things back together again in any meaningful way. He has no interest in doing so and does not feel bad about it. I was faulted by an artist, whose work I recently blogged about, for not discussing her work on its own terms. I drew a distinction between her realism and that of Edwin Dickinson. Her work seemed unable to breach the distance between observer and the observed that was achieved in Dickinson’s work. It did not provide her any solace that I threw my work into the same categorical bin. I just wanted to define a category of painting that yearns for that connection between the self and the world but in the end fails to make the leap. That is a rather interesting position to be in rather than naively thinking you can bridge that gap. And as for making a leap of faith that may only be allowed to a few mystics. In that sense, perhaps, we have to be careful not to force Rauschenberg into a manner of thinking he consciously avoided. Except, that judging from Perl’s experience of the show as a whole, it seems to have left a bad taste in his mouth. He uses the adjective “unseemly”. From my knowledge of his work, the compilations of this work on a large scale in one building might elicit the response that someone should come to rework it and make radical sense out of it. I may have to venture to MoMA to experience this surfeit of undigested clutter. I believe intuitive responses to the whole can be critical in understanding an artist’s work. Why else have retrospectives? The discussion, which involves several philosophers, revolves around unity. When the sock is whole and being worn we are not aware of its unity. When it is torn we become aware or self-conscious of what holds it together in its being a sock. The tear points to a preceding wholeness. To mend the sock makes it whole again with a new self-awareness of an underlying unity. Is this not what de Kooning does: using cubism he takes the world apart and then aggressively with the template of the human body tries to mend it? Hegel says the scission points to a need for philosophy. This bringing back together is powerful in two ways: #1 the effort implied in the mending. #2 the force that resists this mending and wants to tear it apart again. De Kooning’s work participates in this dialectic as it moves back and forth between the whole and its parts to create a new whole. Keeping with sartorial metaphors, we could say that Rauschenberg is the master of mix and match. Because he ignores categories he can draw his playthings from all over the place. The effect of this strategy on subsequent generations of artist has been overwhelming. I wrote about this stylistic habit in the blog “Shake and Bake”. The artists in the show I reviewed have to be commended for not falling into the trap of Zombie Formalism, however, there is a flaccid putting together of odds and ends that is clearly derivative of Rauschenberg. There is no anxiety in accepting the world as having fallen apart and needing mending. Perl says some critics see Rauschenberg as achieving the ”these fragments I have shored against my ruins” majesty of T.S. Eliot and is therefore the artist of the modern condition. Except that, as in the shake and bake crowd, there is none of the anxiety that Eliot felt about a world torn asunder. Did Rauschenberg foreshadow the post-modern condition? According to Perl such a claim is made by Leah Dickerman in the catalog accompanying the show. I believe he did. For him the world is a sandbox where modernism provided him with all the uprooted and disembodied parts to play with. He was the artist perfectly suited for the new globalist space where everything is dislodged from its original context and shaped into momentary illusions of meaning which in the end are nothing more than an excessive piling of things on top of things. He is the happy prankster that mocks the emblems of the King’s claims to power. But being only a prankster and nothing more he has not the worries of a king nor interest in picking up the pieces. If you like your postmodern condition you can keep your postmodern condition and Rauschenberg's your guy, but if not then you are left with a queasy feeling that art and society took a wrong turn in the middle of the last century and there is no turning back.